When we give a speech, we have a real challenge on our hands. We understand the importance of public speaking and we want to be able to keep our audience’s attention for the entire speech. However, listening to any one person talk for any length of time can become boring. How are you going to hold on to your audience’s attention from the time that you start your speech until the time that you wrap things up? As speakers, we have a number of different tools available to us, but one of the most powerful is vocal variety. During a speech your audience is going to be spending the entire time listening to you. If you are not careful, you may end up droning on at some point in time and every word that comes out of your mouth is pretty much going to sound like the words that have come before it. What you need to do is to interject some vocal variety into your speech. When it comes to vocal variety, it turns out that there are six different ways that you can do this. When you are speaking you can vary your tone, pitch, cadence, volume, intonation and inflection. When you want to work vocal variety into a speech, one of the easiest places to start is to work a story into your speech. This makes vocal variety easy because each story generally has multiple characters in it. As a speaker you can exaggerate each character’s voice in order to make sure that your audience can tell them apart from each other. The different voices that you use for each character in your story can complement the different physical characteristics of each character. Sometimes when we want to add a story to our speech, just creating characters that our audience is going to have to picture in their heads may not be enough. When you find yourself in this type of situation, you can invite some puppets to join you on stage. The puppets can take on the roles of the different people in your speech. Each puppet can speak in a different voice in order to help your audience keep track of just exactly who is saying what. Remember that puppets don’t have to be large – you can make each finger on each hand a different puppet and your audience will be able to follow along. How Can You Use Vocal Variety In Your Next Speech? The idea of using vocal variety can cause some speakers a moment of pause. They may not feel comfortable speaking using a voice that they don’t consider to be their true voice. If you happen to find yourself in this type of situation, then one thing that you may want to consider is taking on a different persona. Changing who you are from top to bottom just might be what it takes to give you the comfort that you need to start to speak a voice that is different from your normal voice. When you are thinking about changing how you talk during at least a portion of your next speech, who are you going to use as a role model? We all know people who have a very distinct way of speaking. If we want to capture our audience’s attention, what we can do is emulate these types of recognizable speakers. Examples of speakers that we might want to sound like include a racetrack or sports announcer, a newscaster, a sidewalk barker, or even an auctioneer. Each of these individuals has a unique form of pronounced elocution that we can emulate in order to grab our audience’s attention. Not all of us have the ability to generate a wide collection of different voices. You might think that this could limit your ability to introduce vocal variety into your next speech. However, it doesn’t have to be this way. One thing that you can do is to include the reenactment of a scene from a movie that your audience will recognize. When you do this, you’ll take on the personality of one or more of the actors who are in the scene. Because your audience already knows the movie, you don’t have to be that similar to the actual actors – your audience will fill in any gaps automatically. As speakers we have a tough task ahead of us when we agree to deliver a speech and share the benefits of public speaking with an audience. We have basically signed up to attempt to keep our audience’s attention for the duration of our speech. One of the biggest challenges that we are going to be facing is that if we are not careful we can start to drone on and all of our words will start to sound the same to our audience. In order to prevent this from happening, what we’ll want to do is to introduce some vocal variety into our next speech. Vocal variety can show up in any one of six different ways. You can vary your tone, pitch, cadence, volume, intonation and inflection. No matter what you choose to do, the simplest way to get some vocal variety into a speech is to add a story to your speech where you use different voices for the different characters in your story. 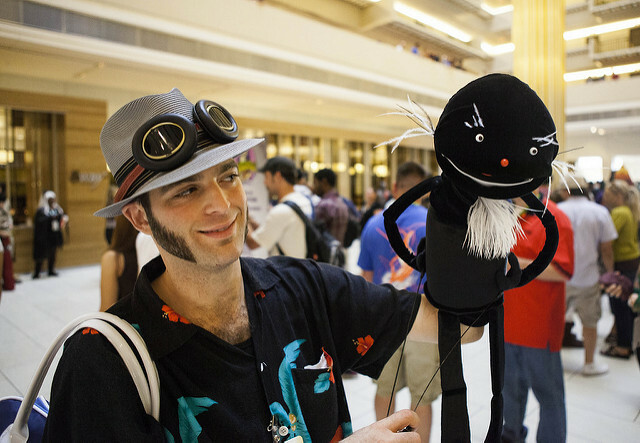 If just talking about character is not enough, you might want to consider bringing some puppets to your speech to help your audience visualize the characters in your speech. If you are not comfortable using different voices in a speech, you might want to try adopting a totally different persona and allowing that person to speak in a different voice. You can always pick a role model who has a distinct way of speaking and emulate them. Finally, if you are not confident that you can pull off a different voice then you can try acting a scene out from a well-known movie. The one thing that none of us want to do when we are giving a speech is to bore our audience or lose their attention. In order to make sure that this does not happen, we have the ability to change how our voice sounds during a speech and by doing so we can recapture our audience’s attention. Try some vocal variety in your next speech and watch what happens. Question For You: Do you think that it is possible to put too much vocal variety into a speech?